This is one of the finest recordings – perhaps the best – of all the many I have heard of Ives. It is also good to have a recording without American performers, not in any way to denigrate US conductors or orchestras, but because a great composer – and Ives is one of the true greats – transcends the parochial and speaks to the world. Great composers are universal treasures and not simply parochial property. 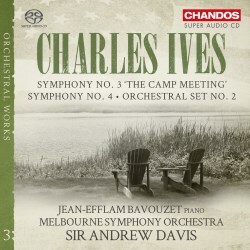 In Andrew Davis and his Australian orchestra, Ives has found ideal and sensitive interpreters. Those who have not previously encountered Ives can find him a surprise, not least in a work such as the 4th Symphony. What Davis does is to incorporate the initially bizarre aspects into an integrated whole, as a rich understanding rather than something shocking and unexpected. That is not to underplay the originality. The recording quality – Chandos at its best – enables the listener to pick out different strands easily. I first heard this great work many years ago in the pioneering Stokowski recording, and I confess that I couldn’t work out what it was about. Advanced recording techniques enable us to hear more clearly the different, and sometimes competing strands, and the logic of the work emerges more clearly. Nevertheless, I shall return to the Stokowski for its insights – one understands afresh why Klemperer held him in such high regard. An interesting comparison is with Andrew Litton’s performance (coupled with the First Symphony on Hyperion CDA67540). Litton has an absolute grasp of the music – I cherish the memory of his performance at the Proms a year or two ago. Davis’ approach is a shade broader, but loses nothing in excitement. Both recordings are admirable and offer some thoughtful contrasts. A particular strength of the new CD is the performance of Symphony No 3. Here Davis is brisker than Litton (CDA67525) , but loses nothing in expression. It is easy to dismiss this symphony as ‘easy’ Ives, but it has a weight and distinctiveness of its own, as well as considerable subtlety. In Davis’ hands, the symphonic quality shines out. An interesting comparison is with Marriner’s recording on Decca 475 8237, with the Academy of St Martin-in-the-Fields. Here the rough edges are perhaps too smoothed out in an elegant performance. Davis catches some of the open-air quality of the work within a symphonic conception. The Orchestral Set, No. 2 is not a makeweight but one of Ives’ most complex and considered works, with snatches of popular hymns and a finale inspired by the composer hearing the crowd in Hanover Square station break into the hymn ‘The Sweet By and By’ on hearing the dreadful news of the sinking of the Lusitania. For me, the Davis performance ranks with Michael Tilson Thomas on CBS (overdue for reissue!). Music-making of the highest order – one to relish.